NEWINGTON - The Bristol Central football team survived an offensive war of attrition Friday night at the Newington High School stadium to come away with a 33-27 victory. The Rams led from the midway point of the second period, but the outcome was in doubt until the final 20 seconds as both teams piled up the offensive stats while the defenses struggled. In the end, Central was able to make a couple more defensive stops than the Indians to even their record to 3-3 on the season. The Rams took a 21-20 lead into the fourth quarter and scored twice to take a 33-20 advantage. Justus Fitzpatrick's 27-yard touchdown run with a minute and a half left sealed the win for Central, but the victory did not come without a scare as sophomore quarterback Nick Pestrichello scrambled to put the Indians on the scoreboard with 24 seconds left and forced the Rams to fall on an onsides kick to preserve the victory. "That was a heck of a battle," Central coach Jeff Papazian said. "It was two teams really competing hard out there all night. They made mistakes, we made mistakes, they made big plays, we made big plays. But in the end, we had more points than they did. I'm really proud of the way my kids kept fighting all night long." The game was one of contrasting offenses that led to a pretty balanced stat sheet at game's end. Central put up 352 yards in total offense, 268 of it on the ground. The Rams turned the ball over on downs twice, including once at the Newington half-yard line, and scored on each of their other possessions. 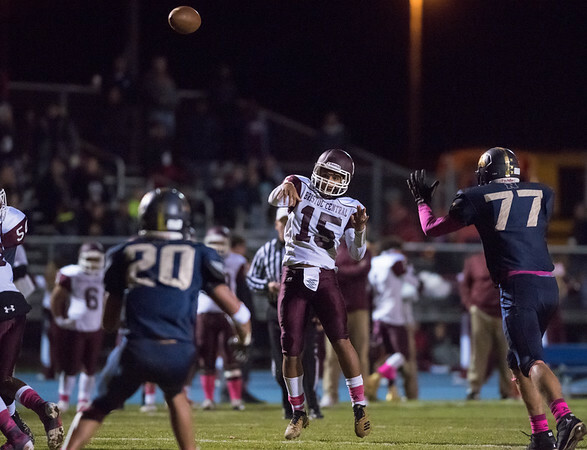 Newington had 311 yards of total offense with 169 of those yards through the air. The Indians punted twice as both teams struggled defensively. Fitzpatrick again led the offense for the Rams. The senior quarterback rushed 30 times for 179 yards and a pair of touchdowns. He completed all six of his pass attempts for 84 yards and a touchdown. Fitzpatrick is 12-for12 through the air in the last two games. Victor Rosa had a big night for Central with 35 yards on five carries and two big pass receptions on key third down plays for another 38 yards. Darrell Payton rushed 14 times for 37 yards and a touchdown and caught a 7-yard touchdown pass. "I think we had a pretty decent night on the ground tonight," Papazian said. "It starts up front with the [offensive] line that did another solid job. With four new starters out there they have just progressed tremendously from week to week and Justus and Darrell are taking full advantage of it." Papazian also singled out Rosa, a freshman, who had probably the best night of his young career and put up his first varsity points when he caught a 2-point conversion pass in the second quarter. "Victor Rosa had a pretty complete game tonight," Papazian said. "He carried the thing and he caught the thing and he was all over the field. He stepped up and made some really big plays for us tonight." Newington scored first in Friday's game after the Rams turned the ball over deep in their own territory off a fumbled snap on a punt attempt. Dylan Nees-Fair, who led the Indians with 104 rushing yards on 27 carries, scored from three yards to put Newington up 6-0 just four minutes into the game. Central countered with the first of many long marches on a drive that covered 67 yards in 12 plays, all on the ground. Payton scored on a 2-yard run and Javon Paloka kicked the extra point to put the Rams up 7-6. Newington countered with a drive of its own to regain the lead in the first minute of the second quarter on a 4-yard run by Nees-Fair. Nick Pestrichello passed to Izayah Ciarcia for the 2-point conversion and a 14-7 lead. But again the Rams countered with another long drive, this one punctuated by a 23-yard pass from Fitzpatrick to Rosa on a third and seven to bring the ball to the Newington six. Two plays later, Fitzpatrick connected with Payton for a 7-yard scoring pass. Fitzpatrick's pass to Rosa gave the Rams a lead they would not relinquish. After forcing the only punt of the first half, the Rams again drove to a score, this time going 87 yards in just seven plays, including back-back pass completions from Fitzpatrick to Nate Rosa covering 42 yards. Fitzpatrick took it in from eight yards to give Central a 21-14 halftime edge. The Indians cut it to 21-20 on their opening drive of the third quarter on a 9-yard run by Nees-Fair, but were stopped on the conversion attempt. Central ate up most of the third quarter with a another long drive, but this time the Indians put up a goal line stand, stopping Central runners four times from inside the 4-yard line. But punting from poor field position, the Indians could get the ball out only to the 33-yard line and it took the Rams just three plays to raise their advantage to 27-20 as Fitzpatrick scored on a 25-yard run. Central came up with its biggest defensive stop of the night after the Indians had driven once again into the red zone. Isak Gonzalez came up with a big sack on Pestrichello on 3rd down and a 4th-down pass sailed just off the fingertips of the receiver in the end zone. The Rams again capitalized with a long drive that featured another big third down catch by Victor Rosa and ended with a 37-yard touchdown run by Fitzpatrick. Central missed the conversion, but led 33-20 with 1:32 showing on the clock. Newington was not finished as Pestrichello completed four straight passes and took advantage of an unnecessary roughness penalty to get the Indians on the board one more time with just 24 seconds left. The Rams suffered a couple more injuries in Friday's game and will be struggling to get healthy before next week's battle at Capital Prep. "I'm proud of the way we battled through a whole bunch of adversity tonight," Papazian said. "But we know we have a whole bunch of work to do to get ready for Capital Prep." Rushing-BC: Justus Fitzpatrick, 30-179; Victor Rosa, 5-35; Darrell Payton, 14-37; Ryan Rodriguez, 1-2. Newington: Dylan Nees-Fair, 27-104; Nick Pestrichello, 8-25, Izayah Ciarcia, 1-9; Julian Ortiz 1-0. Passing-BC:Fitzpatrick, 6-6-0 for 84 yds. Newington: Pestrichello 16-25-0 for 169 yds. Receiving-BC:Nate Rosa, 2-42; Victor Rosa 2-38; Payton 2-4. Newington: Ciarcia, 8-114; Gunnar Johnson, 3-23; Jordan Alexander, 2-13; Ortiz 1-4; Nees-Fair, 1-11; Keenan Esau 1-4. Posted in Newington Town Crier, Newington on Friday, 19 October 2018 23:52. Updated: Friday, 19 October 2018 23:55.